I thoroughly enjoyed this new book by John Sandford. 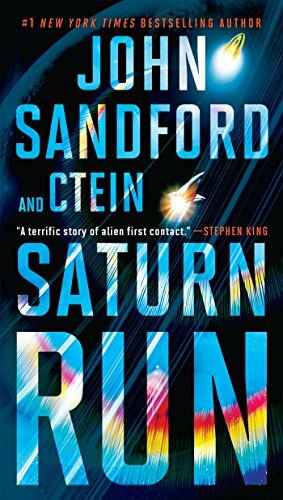 I’m a huge fan of Sandford’s Prey books, so I was intrigued when he wrote this novel about a futuristic space race. Having loved The Martian – I mean, who didn’t – I thought I would give this one a try. While not quite at the level of The Martian, it was close, and I read it in probably four days. The year is 2066. A Caltech intern inadvertently notices an anomaly from a space telescope—something is approaching Saturn, and decelerating. Space objects don’t decelerate. Spaceships do. The race is on, and an remarkable adventure begins—an epic tale of courage, treachery, resourcefulness, secrets, surprises, and astonishing human and technological discovery, as the members of a hastily thrown-together crew find their strength and wits tested against adversaries both of this earth and beyond. What happens is nothing like you expect—and everything you could want from one of the world’s greatest masters of suspense.